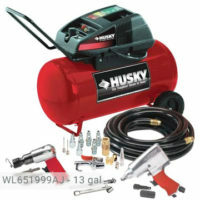 Do you have a commercial automotive shop or a garage that requires both light and heavy air compressor applications? 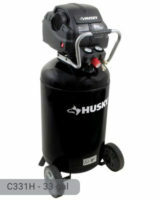 If yes, then Husky 80 Gallon 2-Stage Air Compressor will suit your needs. The machine was designed to run big and small pneumatic tools with its large capacity. 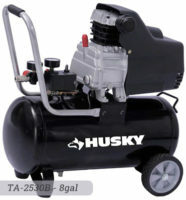 It has the power and endurance that other air compressors could not accommodate. It can run the entire time that you are doing your floor installation. If you don’t want to be limited to simple spraying and nailing, you may use the tool for more extensive tasks such as grinding, sanding, and surface preparations. Since it is a 2-stage air compressor, it means that the air is compressed twice resulting to a more refined and powerful pressure output. This is partnered with an 80-gallon tank receiver to hold up to 83 cubic feet or air at 100 psi. 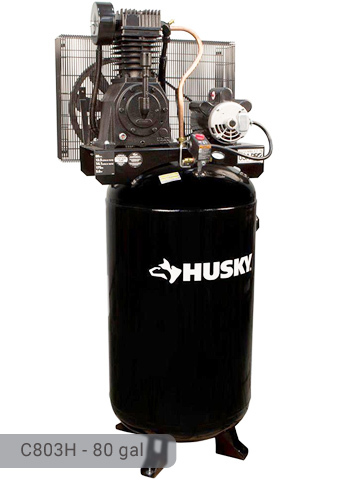 Husky 80 Gallon Air Compressor uses a power induction motor running at 5 HP which is almost 5 times more than other models. It can deliver 13 SFCM at 175 psi and 14.1 SFCM at 100 psi. 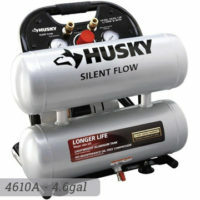 Husky 80 Gal Air Compressor is definitely one of the most powerful air compressors in the market. The pump is oil-lubricated and was designed for industrial purposes. The oil ensures smooth operations and longer pump life. The product comes with synthetic oil which has a better quality and mixture than standard motor oil. There is a need to change the oil as necessary so this machine would require regular maintenance activities. It is also equipped with cast-iron cylinders that cool rapidly which prevents overheating. The steel tank is massive with a weight of 428 lbs. Because of its huge size, it is not portable. For your own convenience and safety, it is recommended that you find the perfect spot to place the machine and make it as stationary as possible. It would not fit in low-ceiling rooms or garages because the tank stands at a tall vertical height (almost 6 feet). With its powerful and fast operations, it is expected to produce loud sounds of up to 78 decibels. Despite its size, it still gives the user some control because of certain features such as the on and off switch for the pressure tank. 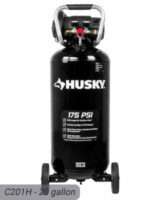 To start running the Husky 80 gal air compressor, you would need an electric power source. The machine is a 230-volt unit which requires hard wiring to a circuit. Wires should be kept at bay to avoid too much heat and voltage loss. The product is not shipped with tools, hose, and other accessories. It’s just the air compressor and a 3/4-inch outlet. Even with the absence of some accessories, you will still get your money’s worth because it is relatively worthy of its price. At an affordable cost (from $1,199.00), you will get all the volume and pressure that you need. Aside from domestic purposes, you now have an air compressor that can satisfy your customers if you have an industrial or automotive business. Hurry and get one now! 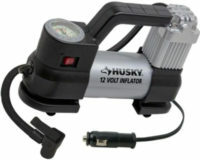 If you already own Husky C803H model or just want to buy it you can share your review or ask a question through the form below.